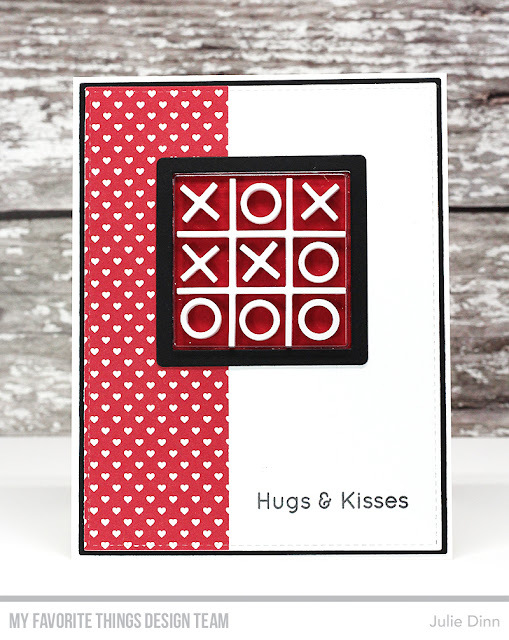 Quick, run to the MFT site to pick up the X's and O's card kit and the Witch Way is the Candy stamp set and Die-namics. They are all available now. I have a couple more shaker cards to share with you today. I kept them both fairly simple. The tic tac toe board is really hard to see on this first card, I used a black board on the black card stock. I love the look in person, but I couldn't get a good photo of it for anything. My second card is full of Hugs & Kisses. 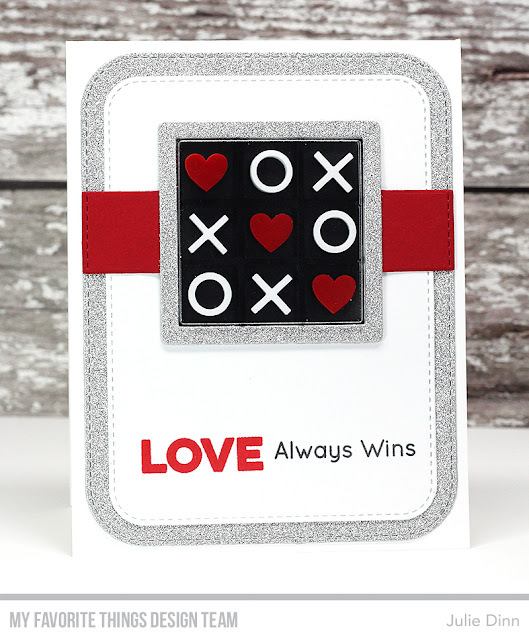 The Tiny Hearts Brights Patterned Paper worked perfectly with the sentiment and the tic tac toe board. I love your work. Great card ideas! Both cards are cute, but the silver, red, white and black one just pops off the screen. Love it! Love your cards and see so many valentine possibilities with this set! Great cards. Love the touch of silver sparkle paper on the first one. Awesome cards. I like this release. Love the classic color schemes. So pretty! Pretty cards! Fabulous textures, colors and design! Love the sparkle in the first card. All these samples wants me to get this kit. Beautiful cards - the glittery one is very classy! Love your designs, especially the sparkle! Thanks for the inspiration! Wow! A fancy tic tac toe board. Beautiful! These are so much fun, especially that glitter! So elegant! Love those classic colour combinations. Great cards! I think they are always better in person and find it's hard to photograph sometimes. Love the clean style and dramatic look of your projects. Thanks! Wonderful cards. Love the use of glitter. Wonderful creation with the new kit! Gorgeous and elegant cards! Thanks for sharing! ooh, the silver background is nice! Pretty cards! Love the silver glitter paper on it! Makes it very special! I like your cute cards. I like the use of silver on the first one. beautiful cards.. love the silver glittered one! I really like both of your cards! The addition of the silver glitter paper is unexpected but fabulous! Awesome layering and colors! What a fun kit!